It’s been a weak opening for the FTSE100, CAC and DAX in early trading this morning. It was all going well until US markets closed last night. The Dow Jones had hit 9,000 for the first time since January and the tech heavy Nasdaq was running high after Apple obliterated earnings estimates. However, just after the market close, Microsoft, Amazon and American Express all released profit figures that fell well short of expectations. Microsoft’s earnings ‘miss’ was felt in particular because the tech sector was playing such a prominent role in the recent rally. The negative sentiment has caused overnight futures and Asian markets to reverse recent gains, but not enough to put major stock markets in the red for the week. Despite the wobble overnight, it still looks like the bulls will finish the week with the upper hand. Today we have a raft of European manufacturing data followed by UK GDP numbers at 08.30 GMT. At 14.30 GMT we get more ‘fed talk’ with FOMC chairman Bernanke testifying and Treasury Secretary Geithner speaking, although quite how they can find anything new to say is beyond me! The Forex markets are relatively quiet this morning with honours even on the yen pairs. There have been some early, tentative moves on the dollar pairs with the pound and euro gaining against the greenback. With a fair amount of European manufacturing data out this morning and some important speeches in the US this afternoon, this makes the EUR/USD today’s pair in play. 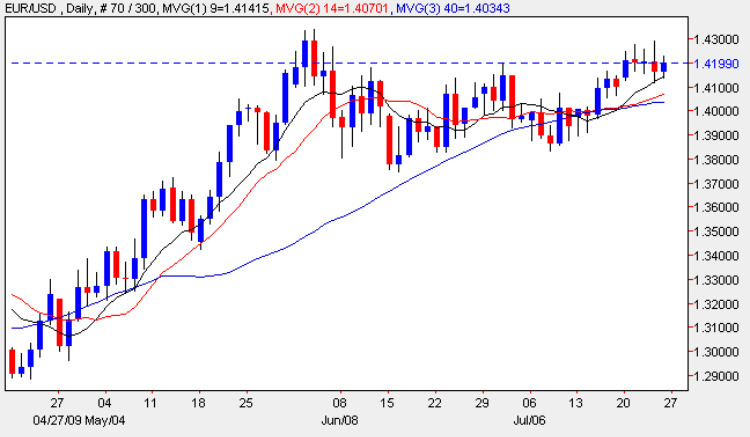 The pair has been in a meandering uptrend since April but has hit a wall of resistance a few times around the 1.4250 area. It has the potential to rise then fall back again. A double touch trade could be an interesting way to play this. A double touch trade pays out if both a higher and lower trigger are hit. A double touch trade predicting that the EUR/USD will hit 1.4250 and 1.4100 in the next 3 days could return over 300%.